I've had this idea for years, to make a fixture that will hold a frame and fork and allow measuring geometry more accurately then what we all do already. There were a few design principles I wanted to achieve. Not relying on a level floor. Not being dependent on tire size. Using a Vernier protractor (that I have used for years during building already) and insuring that it sits square/parallel with the surfaces. Adjustable axle locations to accommodate various wheel mixes (I've build a few with 700c /520 combos). Capacity for a range of frame and wheelbase sizes. And ever important a fun build/making and neat to use. As always I tried to minimize the need for precision machining where possible. The photos do the best job at describing the device. The two axles are set to their heights (the same for most frames). How high off the base beam isn't the issue as the same height is. Both axles are adjustable for drop out width but that's a non element for geometry anyways. A pivoting arm is placed parallel to the ST or HT with a couple of positioning fingers to touch off the ST/HT insuring parallelness. 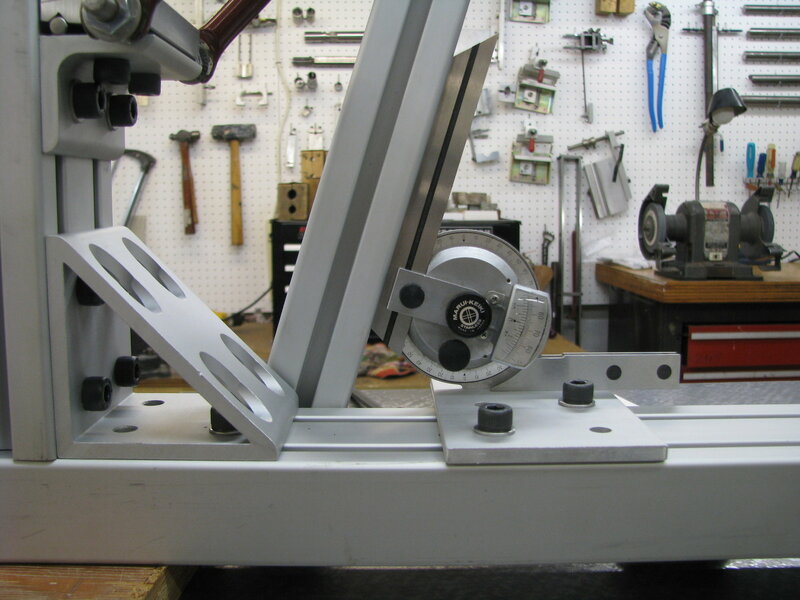 Flat plates at the pivoting arm's allow the protractor to sit nice and square with good engagement lengths. For the HT on the smaller frames I've measured I touch off the fingers on the headset cups. I measure the cups' diameters and so far all three have been the same top and bottom (and could be compensated for if different). 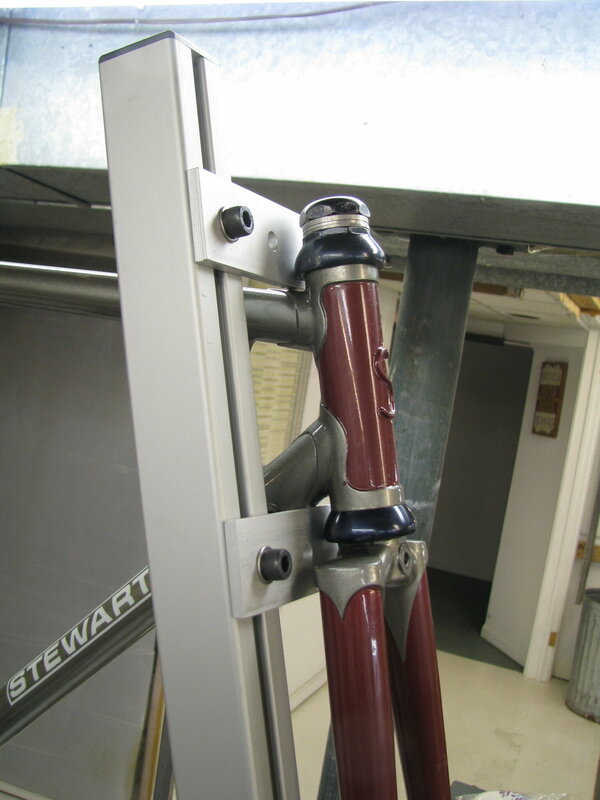 the arm's pivot is tightened to lock the angle. When at the HT I can now directly measure the real fork rake with a caliper. (I hope to make a attach to the arm measuring accessory soon). 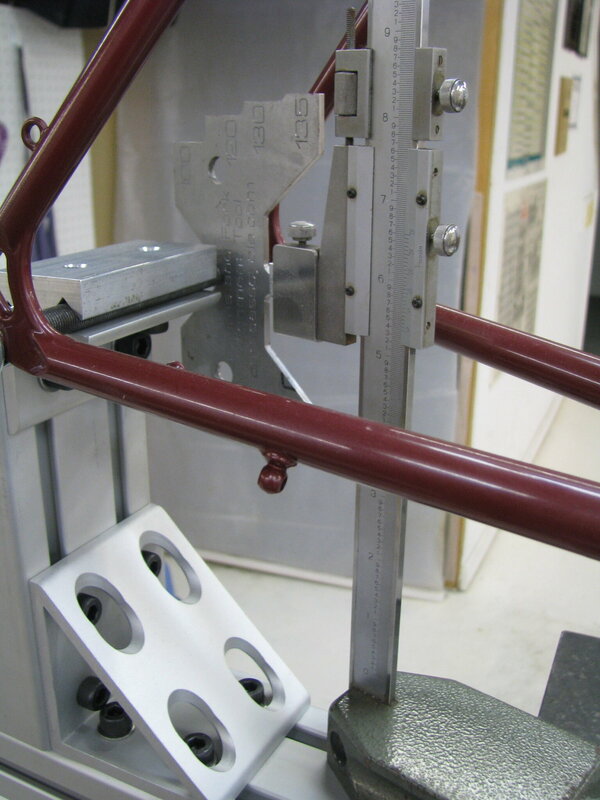 The BB drop is measured by a height gage at the rear axle then at the BB shell and do the math. Another item to make specific to this device. I have measured three frames on mine so far. What have I found? I wasn't that good a builder WRT keeping certain specs 25+ years ago. My ST angles are within 0.25* for all three. HT angles vary by as much as 1.25* in one case, 1* and 0.5* with the others. Rakes were within a few mms for all. BB drops also within a few mms for each. Now these frames were all made prior to having a true jig. I used the Vernier protractor and the hockey stick process to establish main frame angles. My fork jig was self designed and cut out by a friend who had access to a mill (a budding machinist who didn't know enough to better advise me yet). None when built saw my surface plate (that came later) but visited it in time, not that frame alignment is being discussed with this device. One frame was for stock to fill my time and desire to keep building (and it will see the plate soon for that feedback). Another was for my late wife with 622 and 520 rim diameters. Would you recommend that particular vernier protractor? Tom- Only 4" of snow right now, the 50mph winds carried a lot away a couple of days ago. I have two Vernier protractors. The one pictured is my nicer one (about $75 back in 1987). Very smooth in it's motion and with no slop at all. The other was much less expensive and you feel the cheaper production in your hands. But both work well enough for the work frame building takes. I do like this design and the magnifier helps my old eyes. I see other styles that seem to be more cumbersome for what we do. that's a nice build. Needs an adjustable fork. Very nice, I created a much more modest one that mounted to a 1x2" aluminum extrusion rectangular tube. With the axle centers at the same height, it is easy enough to measure off the extrusion and interpolate the dimensions off the that plane along with an angle veneer caliper. I tried a few, including my iPhone, and got reasonably harmonious results. One thing I suspected but confirmed was that not that many "level" top tube bikes have a level top tube. I left the fork rake measure to when having the fork removed. entered the dimensions on an easy to work CAD program. I have met the enemy and it is me... More to my point I have decided I don't have the best measuring design yet. The first three frames I measured, that I made years ago and without the benefit of a "real jig", have been all measured with this device and have rather off spec head angle and BB drop. I reported this in an earlier post. 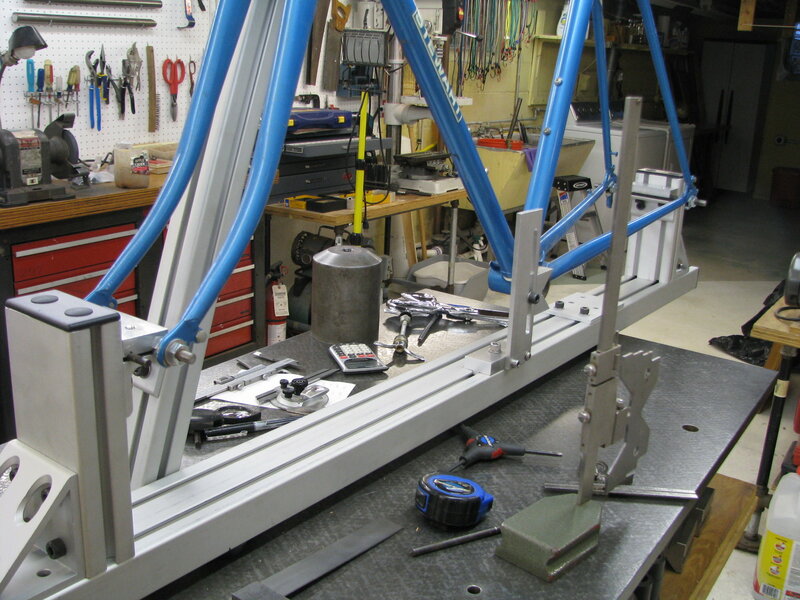 Fast forward to the frame I am in the late stages of making, with my HJ Universal jig I've had for 15+ years, and I measured it a few days ago. The results were frustrating to say the least. Seat tube angle was only "off" by .25*, not bad and I can live with that easily. But the head angle was over 1.5* less then spec and the BB drop was 13mm off too. It's hard to face that possibly two of your children have gone bad One is that the frame isn't what I designed and the other is the measuring device has a flaw. I spent the next couple of days in a bit of a personal funk. Running various aspects through my brain over and over (Did I really set the jig's drop correctly? Is the fork's A-C right? Are the geometry device's scales correct? And more). I went back to the HJ jig and reset the specs then fitted the frame to it and double checked that part of the process. It all jived (by a couple of MMs here and there as I didn't make specific witness marks to re line up). Last edited by Andrew R Stewart; 03-03-19 at 07:07 PM. Here are my thoughts and they should be taken as reminders and not as new knowledge. I have gone through very similar exercise to get my jig dialed in and it is frustrating to chase the errors in pursuit of perfection. The first thing I did was put the main beam on my surface plate and measure any deviations from flat/square. A very small twist will cause all kinds of problems when measured 18-24inches out. I think one of your guiding principles was to limit the precision machining which is smart as you don't want to machine a bunch of pieces until you've proven the approach. 1 - I would lock the location of the axles so they are level relative to your surface plate. Locking the axle locations will remove 2 points of potential variance which will affect everything in between. You won't be able to measure when the front and rear wheels are different diameter but that surely is an outlier anyway. 2 - The BB drop scale is decreasing as the drop increases - in other words, it seems like the scale is set up to measure ground clearance but you're measuring relative to axles - or are you doing calculations comparing the Drop scales to the Axle scales to calculate drop? 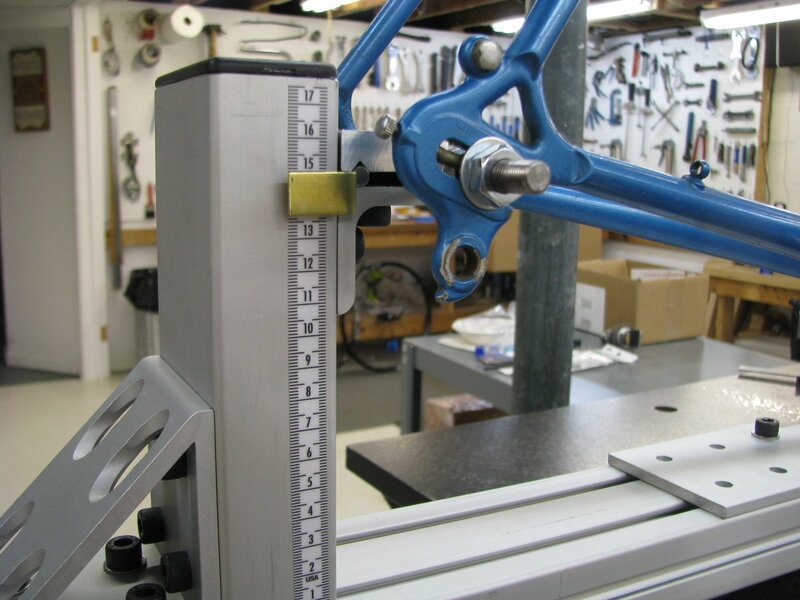 This is another reason to lock the axle position, then you can calibrate the BB Drop scale off of the Axle with the little sideways v-block thingy on the height gauge. 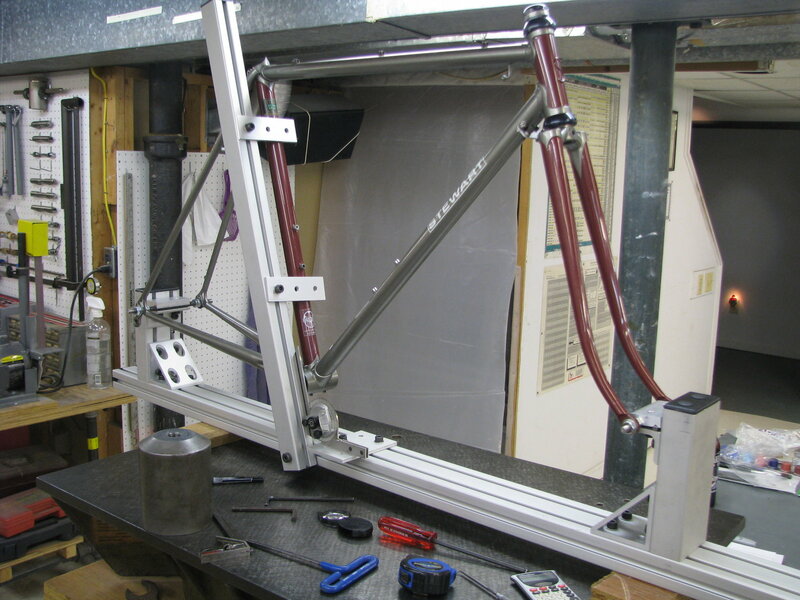 3 - A centering cone on the BB face would seem a better way to measure BB drop and would also allow an extention to pivot at the BB center to measure the seat tube angle relative to the level axles. Fun project. I have a half completed FitStick that is designed to measure main contact points for transferring fit from one bike to another. I need to finish that some day. I have a fitstick, and I dont' really like it. It could have been so much better without changing much. I want to make something like the spesh t-tool. Really though, a drywall square is good enough. on edit: I see there is a new fit stick, and the pictures on their website are too small so I can't tell if they fixed my objections. Do they charge by the pixel nowadays or something? It's also a diet plan, so you have to add "bicycle" to the search terms to find the stick. I designed my fixture to have all primary measurements. So rake, a-c, angles, drop are all set. Well, drop is set at both axles because the fixed spot is naturally at the bb shell for a fixture. And the fork isn't really a fork. I took the idea from the fixtures they had at Grove Innovations. 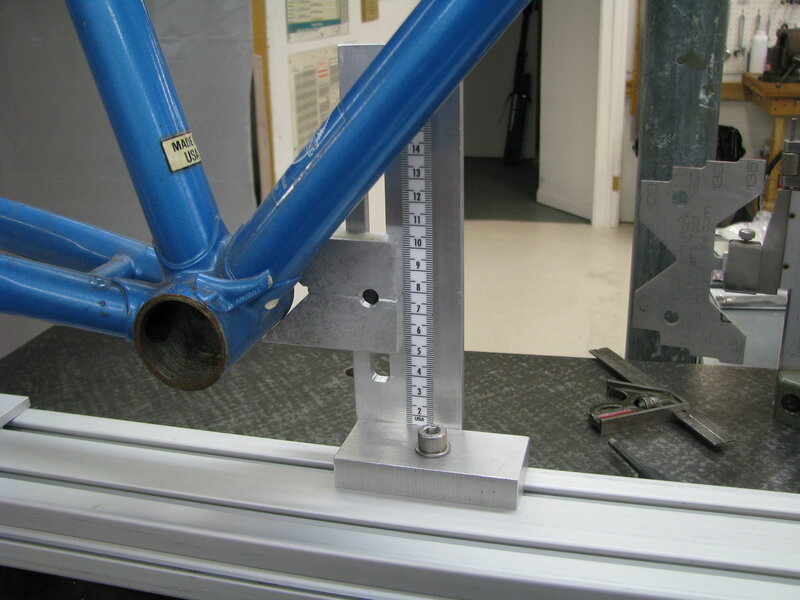 Between my frame fixture and my fork fixture, I am confident I could measure a frame fairly accurately. I need to check my frame fixture on a flat surface, but it's heavy. My working surface for most of the making was my flat surface. 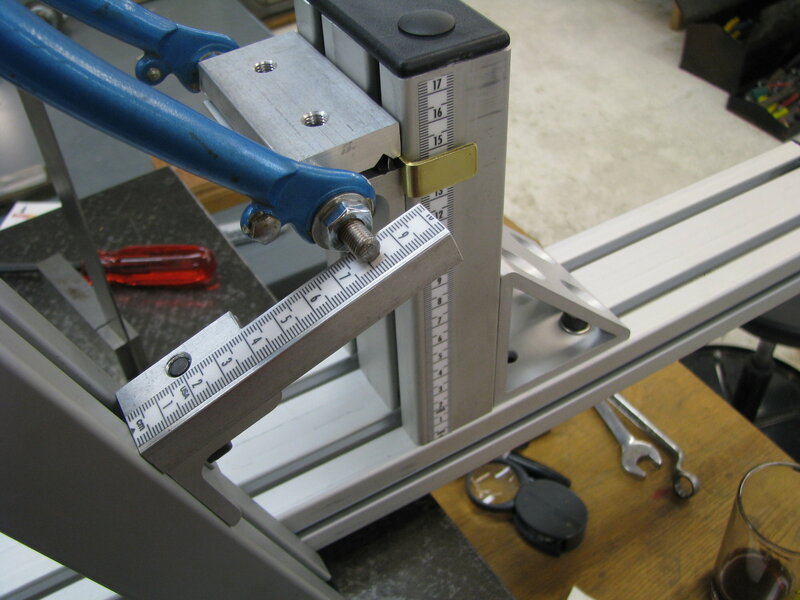 The device has had various squares, height gages and calipers used to cross check and compare measurements. I set the axles as square as i can to both the towers as well as the base. I believe I can level and square up the axles with different wheel sizes. Only the height offset will change. The axle height scales also increase upward. So both the BB and the axles are "measured" with reference to the artificial ground, the base. Subtract the BB height from the axle's height and you get drop. Agree that a cone in the shell would be a good center finder but the "V" block being trapped between the shell and it's upright "blade" are surprisingly repeatable. The ST allows a large gap between the contract fingers and I believe it's angle readings is pretty close to reality. But the HT angle measuring is full of possible errors. I do have some ideas to make this set up more solid and assured. Andy, how are you establishing the steerer CL? With the contact with the HS races? Those races are close and little diameter differences will add up fast. Here cones might well prove their worth. Yes, you will have to pull off a lot of forks to access a suitable hole to fit to at the crown. But that approach could deal with tapered head tubes and steerers. I have a fitstick, and I dont' really like it. It could have been so much better without changing much. . Yes, I have used one as well (also the Serotta one) and think with a few small tweaks it could be useful. One improvement was thicker material to increase rigidity. After the current build, I have plans to invest some time in tooling so, this might make it back onto the Active List. Ben- Yes the arm's angle to the base is controlled by the two "fingers" contacting the back side of the head set cups. (So far the 4 different headsets I've played with have had the same OD top and bottom. But a difference would be easy enough to accommodate). And, yes, I agree that there's a lot of room for errors right now. One goal I have for this device is to not have to remove the fork to measure the angles and such. In fact to retain the fork so that it's effect is taken into account. (These days with so many frames using third party forks the frame's specs is dependent on a specific fork's height as well as the lower bearing stack's height). Just as with the BB measuring "V" shaped interface I am thinking along idea the same for a headtube contact. But the HT contact/centering design needs to accommodate different diameters (or different contact points from the fork's centerline as in using the crown or very top of the blade to further spread the contact points distance apart).